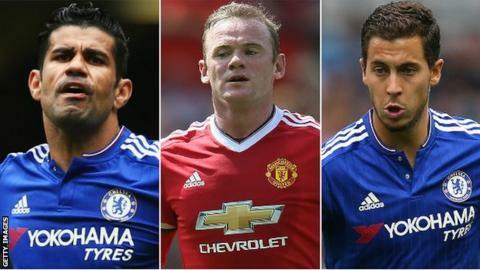 Rooney, Aguero, Hazard, Costa, Sanchez & Kane: What is wrong? Wayne Rooney was England's history man with his 50th goal for his country against Switzerland - but his blank at Southampton on Sunday saw the Manchester United captain set an unwanted personal record. He has now gone 11 games and 954 minutes without a Premier League goal in the most barren spell since his made his Everton debut as a 16-year-old in August 2002. Rooney is not alone among the Premier League big guns in finding goals hard to come by this season - Tottenham striker Harry Kane and Arsenal's Alexis Sanchez have yet to hit the target while Chelsea duo Diego Costa and Eden Hazard have only one each, the same as Manchester City's Sergio Aguero. So what is causing some of the Premier League's most prolific marksmen to dry up? Costa and Hazard were regular marksmen as Chelsea won the title last season. Costa scored 20 league goals in 26 games while Hazard got 14 in 38. While both were happy looking for work of their own, Cesc Fabregas was instrumental as a creator, assisting in 18 goals in 34 games. This season he has only created one, Kurt Zouma's header from his free-kick against Arsenal. Fabregas's lack of service, allied to Chelsea's poor start to the season, has left Costa and Hazard short of the supply line that served them so well so early last season - putting down the marker that saw them lead the title race from start to finish. At this same stage last season, Fabregas had created six goals in Chelsea's first six games. Kane won England recognition on the back of 21 goals in 34 league games last season - but he has struggled in front of goal for his club this season. He has looked an isolated figure for Spurs while his performances for England have been in sharp contrast with a cool, lofted finish in San Marino and a crisp, low first-time effort against Switzerland. Spurs coach Mauricio Pochettino moved to cure the problem with the ultimately ill-fated move for West Brom's Saido Berahino as recognition that the gifted youngster needed more help. South Korean forward Son Heung-min has arrived from Bayer Leverkusen in a £22m deal - and made his mark with the winner at home to Crystal Palace on Sunday. Son can score goals of his own, 29 in 87 for Leverkusen, but an even more crucial role may come in providing the spark that reignites Kane. The new boy will not only provide a talented distraction but come directly and from deep, perhaps allowing Kane the space and time he needs to end his drought. Rooney's current sequence is his worst since 10 games without a goal for Everton between August and December 2003. His goal in the Capital One Cup win against Ipswich Town on Wednesday was his first domestic goal of the season - and his first in that competition since he scored against Aston Villa in the 2010 final. But could the explosive arrival of £36m teenager Antony Martial, with three league goals in two appearances already, release the goalscorer in Rooney once more? Rooney missed the win against Liverpool with a hamstring injury but in five league games this season he has had only three shots on target and been involved in the creation of just six chances. Indeed, he is bottom of the conversion rate stats for Premier League strikers with no goals from a mere seven shots - based on a minimum of five shots. Rooney's days as an out-and-out striker, inevitably reduced in pace and approaching 30, are behind him but the instant impact of Martial hints at a fruitful partnership ahead. For all his recent struggles in front of goal, Rooney can still be creative and explosive in the number 10 role at Old Trafford. Martial still carries elements of the unknown for Premier League defenders - with the pace and ability to drift to the flanks, perhaps opening up spaces in behind for Rooney to make a handsome profit. While Aguero is newly assisted by the width and pace provided by the arrival of £49m Raheem Sterling from Liverpool - as well as the magician David Silva - Chelsea and Arsenal have not brought in reinforcements, relying on Costa, Hazard and Sanchez to attempt to repeat last season's heroics. Have the deeds of last season resulted in the likes of Kane, Costa and Sanchez being snuffed out more easily this time around? Has familiarity bred content for Premier League defenders? Last season, this trio were fresh faces at Premier League level. They are no longer surprise packages so their relative struggles may be no coincidence. Contrast their current struggles to the form of newcomers such as Bournemouth's Callum Wilson with five goals already, Watford's Odion Ighalo with four, and Andre Ayew of Swansea City, Norwich City's Russell Martin and West Ham United's Dimitri Payet, all with three. At this same stage last term, the super six had already scored 20 goals between them - finishing with a combined total of 109 league goals, a spectacular tally and a testament to their importance. Kane, in particular, is suffering from a downturn in goals and opportunities. He has had 12 shots this season with only four on target - but this may be what BBC Sport's Kevin Kilbane calls "the cycle of football". The Spurs youngster is still as dedicated as ever and as determined to succeed - his problem is that defenders now know more about him and will be more determined to stop him. Former Republic of Ireland player Kilbane said: "It is the mindset of the defender, not the other way around. Harry Kane isn't doing anything different. He is as fit as he was and got the exact same ability, but what a defender would do is study video technology constantly. "They will have their own individual programme in place when they get on to the computer. The centre-half will be told what Kane does, look at his best goals from last year, look at positions he takes up - so defenders will do everything to counteract what he does. "Harry Kane now has to counter that and this is the cycle of football. You have to adapt constantly and try to change your own game to get better." Kane and Sanchez were both busy during the summer, although the former's activity was restricted to only three games in England Under-21s' dismal Euros in the Czech Republic. Sanchez was busier, acting as inspiration in Chile's six-game campaign in their own country that led to their first ever Copa America win, converting the vital penalty in the final shootout win against Argentina. He missed the Community Shield victory over Chelsea and was only a substitute in the opening-day home loss to West Ham as Arsenal manager Arsene Wenger gave him extra rest - but he has yet to rediscover the spark that brought him 16 goals in 35 league games last season. Sanchez has yet to even contribute an assist in the league this season - and has literally been on the margins of games on the wide left of Arsenal's set-up. He was a peripheral figure out there in the loss to Chelsea, too often being dragged into defensive positions to be able to influence matters further upfield. So is he too restricted? Graphics of his performance at Chelsea illustrate how Sanchez was restricted to a wide left role. It is not a position that lends itself to the sort of goalscoring record he had last season - indeed it means he now fills the role of creator and any goals may be limited to those in the manner of the spectacular strike against Liverpool at Emirates Stadium last season, cutting in before lashing a shot high past Simon Mignolet. Confidence is the most enigmatic commodity in football. Where does it come from? Where does it go? Is this why players who found goalscoring second nature last season are struggling at present? Aguero looks to be the exception, still playing with high confidence and only being denied three goals by the brilliance of Chelsea goalkeeper Asmir Begovic before finally hitting the target. The Argentine's current conversion rate is still poor, however, with a ratio of 6.67% from 15 shots. It does not tie in with Aguero's superb record of 26 goals in 33 league games last season. There are also obvious signs that betray a lack of confidence in Costa, Kane and Sanchez. Kilbane said: "I saw Costa against Everton at Goodison a couple of weeks ago and he was just taking that extra touch. They all seem to be doing that. "Kane is taking two touches instead of having the one, three instead of two. Last season he may have scuffed one or two in the corners but he hit them early even when he wasn't quite set and the keeper couldn't get himself set." Study the stats for all these strikers and everything points towards them coming through this fallow period. Rooney has demonstrated his prowess remains with a hat-trick against Club Brugge in the Champions League qualifier while Kane was composure personified with his goals for England against San Marino and Switzerland as they reached Euro 2016. Aguero is undisputedly world class while the Chelsea pair of Costa and Hazard will surely gain from their recent improvement and find form. Even Sanchez, currently deployed in a role not exactly suited to regular scoring, has too much quality not to get on the scoresheet with significance. They may need to fight off closer attention from defenders, adjust to new partnerships and positions, or simply come out of a poor run of form - but they have the sort of class that is permanent. Kilbane said: "It might be a 50/50 tackle as a defender or a good first touch as a striker. Sometimes in a game something changes quickly. You never know when that moment is going to be. "And we've said it for years, strikers only need that one goal, the scruffy one and then they might start to go on that run."